Origin and Habitat: Austrocylindropuntia floccosa is found widespread from central-Northern Peru to Bolivia in the Andean High Plateau. Altitude: 3500-4700 metres above sea level. Habitat: This plant grows on the high puna region in dry valleys, rocky slopes among grasses and low bushes in high elevation tropical alpine habitats. Only here and there the brown colour of the grasses is interrupted by the white colour of the big cushions of the "wool cactus," Austrocylindropuntia floccosa (Tephrocactus floccosus). From the distance the plants look like recumbent sheep. The Puna region has a marked dry season and overnight temperatures that drop often below 0°C ( to -15° C ). 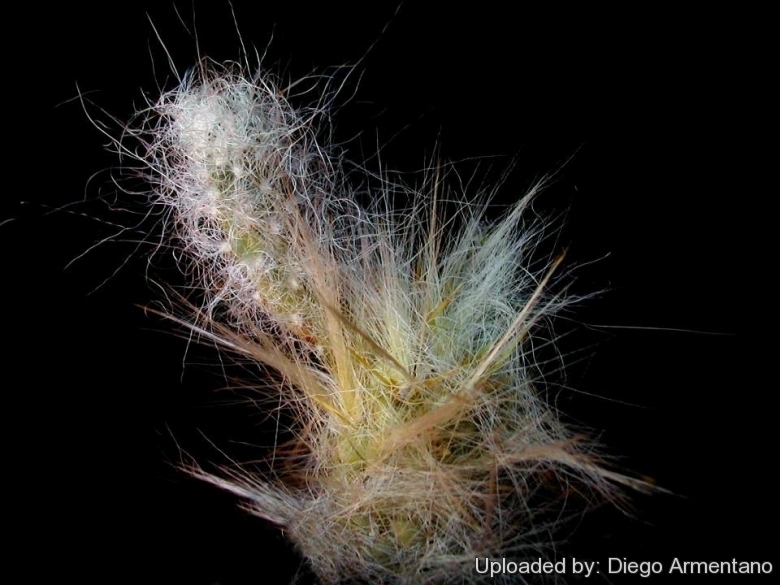 The typical form of Austrocylindropuntia floccosa in central Peru has a dense covering of long hairs that protect from freezing temperatures and from high-altitude ultraviolet light, comparisons in habitat with 'hairless' forms showed that the hairy type maintain an epidermal temperature several degrees higher during the night. Austrocylindropuntia floccosa may be found in nature with its roots in snow-water-logged conditions. Opuntia floccosa (Salm-Dyck) Salm-Dyck in Otto & A.Dietr. Austrocylindropuntia floccosa f. cristata hort. Opuntia floccosa f. cristata hort. Tephrocactus floccosus f. cristatus hort. Austrocylindropuntia tephrocactoides Rauh & Backeb. Cylindropuntia tephrocactoides Rauh & Backeb. Opuntia atroviridis Werderm. & Backeb. in Backeb. Tephrocactus crispicrinitus Rauh & Backeb. in Backeb. Tephrocactus cylindrolanatus Rauh & Backeb. in Backeb. Tephrocactus pseudo-udonis Rauh & Backeb. Description: Austrocylindropuntia floccosa, (syn: Tephrocactus floccosus), is a groundcover cactus that forms thousand-head colonies or compact cushions of up to 60 (and over) cm of diameter. This plant is covered with a dense, long-woolly felt of white hair and yellow spines from which emerge bright yellow flowers. Segments: Short cylindrical, sometimes ellipsoidal to subglobose, up to15 cm long, 6 cm in diameter, spirally tuberculate. Areoles: Borne high on tubercle shoulders. Leaves: Rudimentary, awl shaped, dark green, fairly persistent, to 7 mm long. Glochids: Long, hairy, soft, sinuous, entangled or straight, sometimes absent and whitish/grey. Spines: Occasionally 2 or more numerous yellow, erect approx. 2 cm long. Fruits: Truncate globose, sometimes with tubercles, yellowish when unripe, sugary/orange when ripen and slightly hairy. Austrocylindropuntia floccosa (Salm-Dyck) F.Ritter: It is a groundcover cactus that forms low compact cushions covered with long-woolly white hairs. Austrocylindropuntia floccosa f. cristata hort. : Crested form. Austrocylindropuntia lagopus f. rauhii (Backeb.) F.Ritter: This is a very woolly form from Huancayo, Junin, Peru. It is very similar, if not the same, as the type. 7) Curt Backeberg, Frederic Marcus Knuth: “Kaktus-ABC.” 1936, S. 105. 8) Curt Backeberg: "Die Cactaceae: Handbuch der Kakteenkunde." 2. Auflage. Band I, Gustav Fischer Verlag, Stuttgart New York 1982, ISBN 3-437-30380-5, S. 233–235. 9) N. L. Britton, J. N. Rose: “The Cactaceae. Descriptions and Illustrations of Plants of the Cactus Family.” Vol I, The Carnegie Institution of Washington, Washington 1919, S. 86–87. 10) O. F. Cook, Alice Carter Cook: “POLAR BEAR CACTI: Analogies between Polar Bears and Shaggy-Haired Cacti of the High Andes of Peru As Examples of Adaptation to Special Conditions of Existence.” In: Journal of Heredity. Band 8, 1917, S. 113–120. 11) Urs Eggli, Leonard E. Newton: “Etymological Dictionary of Succulent Plant Names.” Springer, Berlin/Heidelberg 2010, ISBN 978-3-642-05597-3, S. 85. 12) Curt Backeberg: “Die Cactaceae: Handbuch der Kakteenkunde.” 2. Auflage. Band I, Gustav Fischer Verlag, Stuttgart New York 1982, ISBN 3-437-30380-5, S. 233. 13) Christoph Friedrich Otto, Albert Gottfried Dietrich (Hrsg. ): Allgemeine Gartenzeitung. 13: S. 388, 6. December 1845. 14) Friedrich Ritter “Kakteen in Südamerika: Ergebnisse meiner 20jährigen Feldforschung” Band 4, 1981, S. 1244. Cultivation and Propagation: Not easy, because of the mountain environment in which the plants live is subject alternately to hot and freezing along with strong altitude ultraviolet light. Growth rate: It is a relatively small growing species that will make large clumps whit hundreds or even thousands heads given the best conditions. Soil: It grows well in a very draining mineral potting substrate. Exposure: They need as much direct sun light as possible to encourage the heaviest spines an wool formation, plants in shaded positions grows etiolated and fail to produce the typical hairy covering. Watering: During the summer they enjoy average watering, but do not overwater (Rot prone), keep dry in winter. However it proven to be able to grow outdoor even under wet, cool conditions in many temperate climates in Europe (E.g. Southern England) and North America, providing to grow it in perfect draining substrates, though it is slow to make its large cushions. Hardiness: They need to be kept in a cool place during the winter rest (at 0 to -10°C) this is important for the flowers as well as for their health. They are quite winter hardy and can be cultivated outdoor, if adequately protected from the rain and kept dry. - Rot: They are susceptible to fungal diseases if overwatered, but are not nearly as sensitive as many other cacti. If kept damp through cold periods, they will invariably suffer. However rot is only a minor problem with cacti if the plants are watered and “aired” correctly. If they are not, fungicides won't help all that much. Uses: It is an excellent plant for container growing. It always looks good and stays small. It looks fine in a cold greenhouse and frame. In its native Peru it is planted as hedge plant and on the top of loam walls for a better protection of farms. Traditional uses: The fruit are eatable and when they are applied on contusions help to reduce the swelling (Anti-inflammatory). Warning: Has very sharp spines and cultivated plants must be handled carefully. Propagation: Seeds or cuttings. It branches enthusiastically, and offsets are readily available. If you remove an offset, remember to let it dry for some days, letting the wound heal (cuttings planted too soon easily rot before they can grow roots). Lay it on the soil and insert the stem end partially into the substrate. Try to keep the cutting somewhat upright so that the roots are able to grow downward.